I am trying to work with files from the new Sony a7S in Symphony 8.1 (it's the new 1080/4k low-light monster camera). The camera uses a flavor of MP4 that is called XAVC-S. And a good chuck of the footage is shot in Sony S-Log2 (with or without S-Gamut) -- requiring a LUT (although I can deal with the transform myself). I (and apparently others) have tried the traditional importing method -- and it's a no-go. We have also tried AMA using Sony's XAVC AMA plugin, however the plugin does not seem to support XAVC-2 (or S-Log2 and S-Gamut for that matter). The basic reason why we can't work XVAC S with Avid Media Composer is that XAVC S codec is a new one, and is not widely supported. And XAVC-S is not supported by AMA plug-ins. To make the XAVC S videos compatible with Avid MC, the easy workaround is to convert XAVC S to DNxHD codec, which ensures the best results when using in Avid. 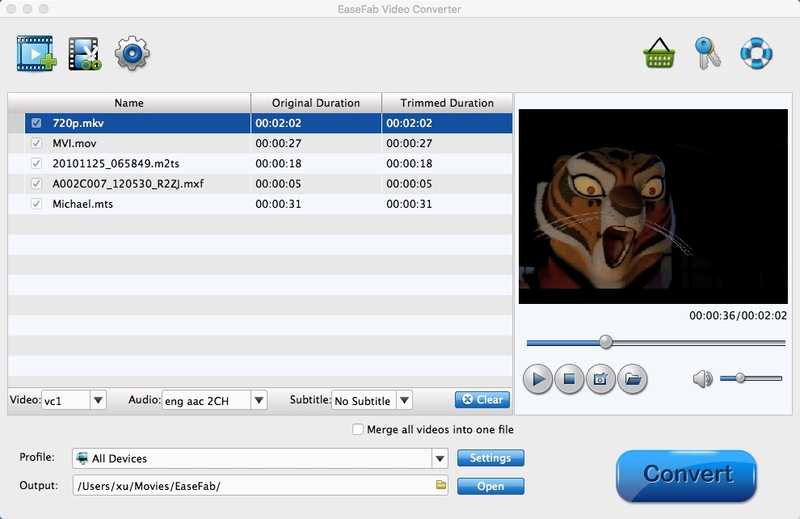 EaseFab Video Converter for Mac is the solid tool to help users make the XAVC S to Avid DNxHD transcoding on Mac OS X. With it, youcan effortlessly convert XAVC S footage to Avid highly compatible DNxHD MOV files, ensuring maximum editing quality and efficiency when working with Avid MC8/7/6/5/4 and more. Besides, it also exports advanced encoders like Apple Intermediate Codec, Apple ProRes, MPEG-2, etc. allowing you to convert video to seamlessly fit iMovie, Final Cut Pro, Adobe Premiere, etc. If you're a PC user, you can turn to the Windows version here, which can help you transcode XAVC S to DNxHD in Windows (Windows 10 inclued). Here is how to do the conversion. Install and run the XAVC S Video Converter on your Mac, then run it. Click on "Add", and browse your files; select all the XAVC S files you wanna convert. If you want to combine all the files together for easy importing to Avid, please tick the box "Merge into one" on the main interface. You can directly choose the DNxHD preset from "Editing Software" category for Avid Media Composer which has been supplied by the XAVC S to Avid Converter. The settings also works for Avid MC 8, Avid MC 7, Avid MC 6 and Avid MC 5 etc. After all necessary settings, hit the convert button to start the XAVC S video to Avid DNxHD conversion on Mac OS X. Once the conversion process shows in 100%, click Open to get the output videos. Create a project and start editing XAVC S video in Avid MC with light speed.